It’s no secret that humans are all shapes and sizes. All you have to do to see these different sizes is look around you while you are at work, the grocery store, the airport, a sporting event, etc. How do we account for these different sizes of human operators in the work environment? The answer is using anthropometric data. Anthropometry is the study of the human body measurements especially on a comparative basis (Merriam-Webster). The data yielded from anthropometric studies is extremely valuable in designing workstations, work processes, tools, equipment, etc. for employees in all types of industries/work environments. 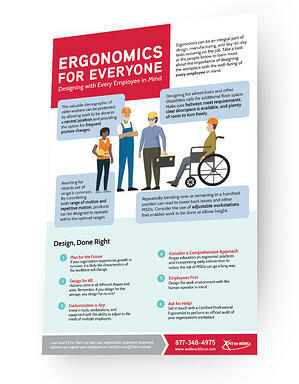 Download the infographic to learn more about how your organization can implement ergonomic solutions and support your employees in a healthy and efficient manner!